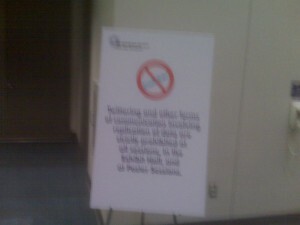 Twittering and other forms of communication involving replication of data are strictly prohibited at all sessions, in the exhibit hall, and all poster sessions. I’ve been following the DTC genomics and personalized medicine discussions for years now. I’ve learned that there are diverse and well-reasoned arguments by capable spokepeople proposing many possible futures for the doctor-patient relationship. Discussions during this weekend’s BIL:PIL conference and a recent exchange with Dr. Steven Murphy, with whom I’ve disagreed, occasionally vigorously, for years prompted me to put down my thoughts here. Actual meeting notes will follow in a separate post. I believe, as does pretty much everyone, that medicine is on the cusp of great changes and that personalized medicine holds great promise. I believe that an informed patient is an empowered patient, and ultimately a healthier one. Every good doctor should want this, and every below-average doctor should pray this day never comes. Does adding tweets to friendfeed affect twitter followers? A discussion broke out recently on Friendfeed about online commentary on scientific articles. The discussions were interesting because, for the first time in recent memory, there was disagreement about something fundamental. I view this as an extremely positive sign that out community is starting to grow and incorporate people outside of our core group. In fact, if there’s no disagreement, it’s probably a sign you’re doing something wrong.